Note: This item ships to customers within the U.S. only. Hanging baskets aren’t just for flowers anymore! Bring holiday cheer to your front porch with this lovely Elegant Evergreen Basket. This charming basket is loaded with noble fir, white pine, and western red cedar topped with ponderosa pine cones, red or gold ornaments, and a hand-tied bow in your choice of red or gold. Lynch Creek Farms is a family-owned business established in 1980. They have transformed from selling a few flowers and vegetables at the local farmer's market on the weekends, to a full blown year-round business that ships throughout the United States. Lynch Creek Farms does not cut down trees! 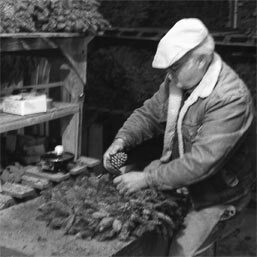 Most of the boughs cut for their Christmas wreaths come from the Cascade Mountains, near Mount St. Helens. Noble fir trees are never cut down when harvesting but trimmed on the lower branches to ensure a lifetime of bough production. This practice of trimming the lower branches helps to ensure a healthy tree in the future while maintaining a natural and beautiful forest. They use local tree farmers! Local tree farmers in the area are also a great source of boughs for their Christmas wreaths. Preserving the forests of the Pacific Northwest! Within the forests of the Pacific Northwest the nobel fir tree is important to preserve because it provides habitat for numerous birds, bees, insects, and larger animals like the black-tailed deer, coyotes and bears along with many other animals. Supporting environmentally conscious local farmers and maintaining our private forests help protect our fragile ecosystem now and in the future.